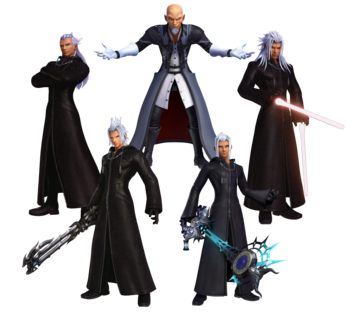 The many incarnations of Xehanort. The Dark Seeker Saga (ダークシーカー編, Dāku Shīkā-hen? ), informally known as the "Xehanort Saga" (ゼアノート編, Zeanōto-hen? ), is the phase of the Kingdom Hearts series from the first Kingdom Hearts game to Kingdom Hearts III, that details the battles between Sora and Xehanort, as well as various other heroes of the light swept up in the conflict. According to series director Tetsuya Nomura, the Dark Seeker Saga is only the first phase of the Kingdom Hearts series, which will continue after the saga is complete. "This world is just too small." Xehanort, the boy who sought the world. Xehanort, a young man from Destiny Islands, yearns for a way to leave his home for a more adventurous life. Eventually, he manages to do so, by means unknown, and comes to live in Scala ad Caelum, where he becomes a Keyblade wielder under a Keyblade Master and befriends a fellow apprentice, Eraqus. Xehanort and Eraqus eventually come to see each other as brothers, but their friendship is shattered by their conflicting beliefs in the balance of Light and Darkness. While Eraqus believes Darkness must be destroyed, Xehanort believes Darkness can be controlled with enough training. Xehanort and Eraqus eventually pass the Mark of Mastery exam and are deemed Keyblade Masters, but Xehanort, having learned much of Keyblade lore, particularly the events surrounding the famed χ-blade and Kingdom Hearts, sets out on a mission to merge with Kingdom Hearts and remake the universe in his own image, despite the lives it will cost. His first step is to find a vessel to transfer his heart into from his now-aged body, but his apprentice, Ventus, proves to be too frail for this, so he instead decides to use Ventus for the χ-blade by extracting the Darkness from his heart into a separate being, Vanitas. Though Ventus survives the ordeal, Xehanort takes him to Eraqus in the Land of Departure to be trained in Light. In the process, Xehanort meets Eraqus's two students, Terra and Aqua, and sets his eyes on Terra as his new vessel. "Out with the old and brittle vessel, and in with a younger, stronger new one!" Xehanort manipulates Terra into using the darkness. Four years later, Xehanort begins to manipulate Terra into turning against his friends and loved ones and luring him toward the Darkness. First, he sabotages Terra's Mark of Mastery exam and then stages his own disappearance. Along the way, Xehanort comes into contact with an evil fairy, Maleficent, and tricks her into beginning a quest to gather the Seven Princesses of Heart, maidens with no darkness in their hearts. Once "found" by Terra, Xehanort "guides" Terra in the ways of the darkness, and stages his own kidnapping at the hands of a lackey, Braig, in order to provoke Terra's anger and vulnerability to darkness. Along his way, Terra comes across Destiny Islands, where he meets a young boy, Riku, and chooses him as his successor to wield the Keyblade one day. Meanwhile, on Xehanort's orders, Vanitas goads Ventus into chasing after Terra, who Ventus has come to love like a brother, in order to make him stronger for the χ-blade. Through Xehanort's machinations, Eraqus almost ends Ventus but is stopped by Terra, who battles him and injures him, while Xehanort delivers the final blow. With his plans revealed, Xehanort goads Terra to meet him at the site of the Keyblade War, the Keyblade Graveyard, while Ventus and Aqua are instructed to do the same. Ansem the Wise finds an amnesiac Terra-Xehanort. At the Keyblade Graveyard, after an epic battle, Xehanort finally puts his plans into action. He transfers his heart into Terra's body and becomes Terra-Xehanort, but Terra's Keyblade Armor comes to life as the Lingering Will and defeats Xehanort. Vanitas succeeds in possessing Ventus and creating the χ-blade, but Aqua, aided by fellow Keyblade apprentice, Mickey Mouse, manages to defeat Vanitas and shatter the χ-blade, creating a corridor which scatters everyone present to different locations. Xehanort ends up in the Radiant Garden, but with his memories slowly leaving due to Terra's heart resisting him. Aqua finds him and manages to defeat Xehanort after an intense battle, allowing Terra to gain the upper hand, but Xehanort retaliates by stabbing himself with his own Keyblade and falling into the Realm of Darkness. Aqua sacrifices herself to save Terra-Xehanort, ending up trapped in the Darkness. Xehanort, now with apparent amnesia, is found by Ansem the Wise and taken in as one of his apprentices. Even and Ienzo, two of Ansem the Wise's apprentices, are consumed by darkness. A year later, however, Xehanort slowly begins to regain his memories as Master Xehanort. He and Braig successfully manipulate Ansem into experimenting with the heart in order to produce Heartless, and when Ansem refuses, they and the other apprentices, Dilan, Even, Aeleus and Ienzo banish him to the Realm of Nothingness and Xehanort steals Ansem's name. Eventually, Xehanort regains his memories completely and apparently turns himself and the other apprentices into Nobodies, becoming the founders of Organization XIII, a group of thirteen Nobodies with the intention of harboring a piece of Master Xehanort's heart as an alternate way of creating the χ-blade. But knowing full well that over time, the Nobodies will begin to develop hearts and personalities of their own, Xehanort's Heartless steals his teacher's name, travels back in time and contacts Xehanort as a young man, granting him the ability to travel through time and begin gathering various incarnations of himself together as a backup plan. Ansem, Seeker of Darkness is weakened by Sora, Donald, and Goofy and finished off by the light released from the Door to Darkness. Now split into a Heartless and a Nobody, Xehanort continues his plans in two different directions. As Ansem, he leads an army of Heartless across several worlds in order to swallow as many as possible, while as the Nobody Xemnas, he begins searching for more Nobodies to join Organization XIII. Nine years later, however, Xehanort's plans begin to fall apart due to the intervention of another Keyblade wielder, Sora, who defeats Maleficent and her council of villains, and successfully defeats Ansem at the End of the World. Meanwhile, Xemnas completes his Organization, the thirteenth member being Sora's Nobody, Roxas, who can also wield the Keyblade and use it to gather hearts for an artificial Kingdom Hearts. As a backup to ensure a Keyblade wielder loyal to their cause, Xemnas creates a Replica of Sora, Xion, for the purpose of absorbing Roxas and becoming an obedient clone of Sora, but this plan falls apart when Xion develops her own personality and is defeated in battle by Roxas. Xemnas merges with Kingdom Hearts in order to eliminate Sora and his friends. Sora and Riku, meanwhile, eliminate the members of the Organization one by one until only Xemnas is left. Xemnas merges with Kingdom Hearts and engages Sora in a final battle, but is defeated and fades into darkness. "All of this was decided. My twelve selves would welcome me here on this day, when I would return a complete person. It is the future which lies beyond my sight." With the destruction of both Ansem and Xemnas, it appears that the madness of Xehanort has been destroyed forever, but it is soon revealed that this is merely the beginning, as this will inevitably lead to the revival of Master Xehanort himself. To counter him, retired Keyblade Master Yen Sid puts Sora and Riku through the Mark of Mastery exam in order to make them strong enough to defeat Xehanort. However, a mysterious youth hinders their journey, eventually guiding Sora back to The World That Never Was and capturing him. Master Xehanort calls together his new Organization XIII. Riku tracks Sora to the Castle That Never Was, where he is confronted by the youth. The young man reveals himself to be Xehanort from the past, given the ability to travel through time by Ansem in order to gather the many versions of Xehanort to attend the revival of Master Xehanort. Upon his revival, the Master admits that he miscalculated his previous attempt to forge the χ-blade with Ventus and Vanitas, but resolves to forge it correctly by pitting his thirteen Seekers of Darkness, composed of himself and his twelve other vessels from across time and space, against the seven Guardians of Light, either the seven princesses of heart or seven Keyblade wielders protecting them. However, as Master Xehanort prepares to place a fragment of his heart inside Sora's body to complete his group, his plans are foiled by Lea, Riku, and Mickey. In this situation, he is forced to retreat with his incomplete Organization, sending them back to their proper times and promising that they will all meet again at the predestined final battle. "The World needs someone to stand up and lead! Someone strong to stop the weak from polluting the World with their endless darkness! Someone to dictate their destiny!" Master Xehanort eventually succeeds in completing his new Organization, but his plans are delayed when the reserve members of the Organization, Vexen and Demyx, secretly defect to Ansem the Wise in order for Vexen to atone for his past crimes while in the original Organization. However, he ultimately obtains Xion as the final member of his new Organization. He is confronted by Sora's party, among them Aqua and Ventus, in the Keyblade Graveyard. Sora and his allies defeat the Organization members one by one and manage to expel Xehanort's influence from Terra, robbing Xehanort of another member. In order to enrage Sora, Xehanort strikes down Kairi and takes her heart in order to forge the χ-blade and open Kingdom Hearts, but Sora takes advantage of Xehanort's time travel abilities to use his body as a portal and banish him back to Scala ad Caelum, giving chase along with Donald and Goofy. In Scala ad Caelum, Xehanort absorbs the essences of the Organization members into his own being and engages Sora in a final showdown. Though Xehanort almost wins, he is defeated when Sora, with help from Donald and Goofy, pierces him through the chest with a ray of light, mortally wounding him. Struggling to stay alive, Xehanort explains that all he wanted was to create a world of light which would never again be corrupted by darkness but which would be ruled by him; though sympathetic, Sora counters that it was not Xehanort's decision to make, which prompts Xehanort to admit that Sora reminds him of Eraqus. Sora's allies emerge, having followed through Kingdom Hearts, and Xehanort is confronted by the essence of Eraqus, who had been residing within Terra's heart the entire time and who persuades Xehanort to stand down peacefully. Xehanort concedes and respectfully hands the χ-blade to Sora, congratulating him on his victory, and joins Eraqus as they pass away together to the Final World as friends once again, after which Sora uses the χ-blade to close Kingdom Hearts and appears to sacrifice his own being to use the power of waking to restore Kairi. Though gone, Xehanort's machinations live on in the form of Luxu, the sixth apprentice of the Master of Masters and who had been masquerading as Braig and Xigbar in order to ingratiate himself with Xehanort as per the Master of Masters's orders. Luxu summons foretellers Ira, Aced, Gula, and Invi to the Keyblade Graveyard to tell them about his experiences with Xehanort, mirroring a chess game between Eraqus and Xehanort involving pieces representing Sora, Luxu, Ira, Aced, Gula, Invi, Ava and the Master of Masters. In the meantime, Sora awakens in an unknown world, observed by Yozora. ↑ LA Times July 26, 2013, "Tetsuya Nomura is ready — at last — for 'Kingdom Hearts 3' to progress"
This page was last edited on 13 April 2019, at 12:26.